Continuing from our previous article Rats storming our garden, February 2009. O, what bliss! Joy and peace at last in our little garden paradise! No sign of the abominable vermin for almost two months! No more cleaning their mess! And, no more setting useless traps and the like! What caused the rats’ disappearing act? How and why? Enough was enough! We’ve procrastinated too long and allowed the rat infestation to develop into a crisis. Positive steps have to be taken towards their riddance. John and I finally did some post-mortem and took the necessary steps. First, we tried to identity nearby spots outside our home that could be sheltering these rascals, enabling easy access to our garden. Yes, there were two areas where they were seen. One, at the unpaved sidewalk just outside our chainlink fence where some broken earthen pots were inverted over to prevent growth of weeds. Thus, we cleared away the earthen pots. Weeding is much easier than cleaning the mess deposited by the detestable rats, don’t you think so? The other, seen just 2 meters away at our neighbour’s outside, was a large roundish cavity in the ground (roughly 30cm across x 30cm deep). Since our neighbour weren’t bothered by the rats or the hole, John decided to fill it up for our own benefit, with clayey soil dug by the rats from our garden border. Then, we tidied up our front yard. Lots of empty pots were discarded, so also were potted plants that were one too many, aligning the perimeter of the garden and providing obscurity for the vermin. Also, we rearranged the potted plants into small circular groups wherever possible, so that there are open spaces in between. Next, we revamp the garden porch area where the rats usually converge to ‘party and get drunk’, urinating and pooing indiscriminately. We’re most affected by the resulting stench from this area which is just outside our sitting hall. 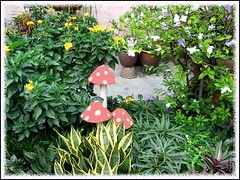 Garden decorations, such as pebble stones and mini fences have to go. 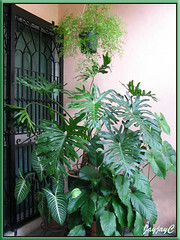 Some potted foliage plants were reshuffled to the courtyard and backyard, reducing to the minimum. Rearranged the balance to form just 2 islands and raised the potted plants on metal stands. The images below give you an idea of the shift: the left photo shows a previous setting, while the right is the current setting of a single grouping. Also, the outer garden border was further tidied. The Crossandra infundibuliformis bush where the rats love to dig beneath, was removed. 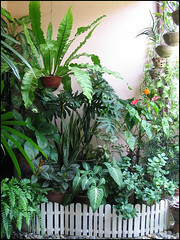 Low-growing plants, such as the Variegated Oyster Plant, Dwarf Purple Ruellia, two kinds of Birdnest Sansevieria and Mexican Heather that were in excess were discarded, and the remaining few replanted and repositioned to make it eye-catchy, yet uncrowded to discourage the rats’ presence. The picture below shows the previous condition that was conducive for the rats frequent digging. Are the rats gone for good? We really hope they are! Vanished forever from our garden and not just temporarily…fingers crossed! !